i read that i should modify d2Client for disabling Akara Respec but i didint find the correct address to do it. Changing this 4 to 3 should work, at least it worked for me. Thank you for the answer jessedazebra. I had already read the thread you suggested and the problem is just that. I don't find address 6FAFA3A0 in my d2client.dll which is definitely shorter (it ends with address 10AFFE). SOLVED: The correct address for 1.13c is 4A3A0. It just adds offsets to the address when the game is loaded. Read CE tutorials on the site, it will clarify a lot of things. Well, I didnt konw about addrees change when game is loaded .....Thanks for info. Any idea about the address for disabling akara respec in unloaded 1.13d? 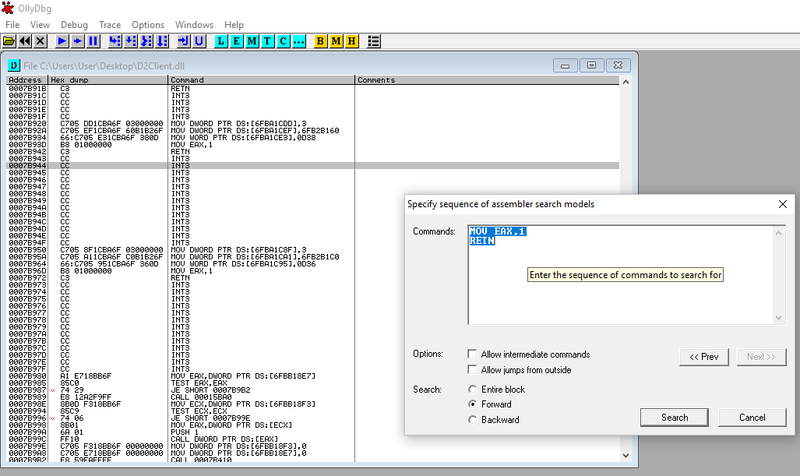 Try to use Search for > Sequence of commands in olly 2.01. 1.13c and 1.13d codes pretty much the same, only offsets differ.